Tory Historian was browsing through YouTube (yes, technology has reached even TH), looking for films of historical content and importance. No sign of any excerpts from The Young Mr Pitt on which there was a posting before. So, Laurence Olivier it has to be. There are many possibilities but here is one of Tory Historian's favourites: the St Crispin's Day speech. No, this is not the right day for it, but could anyone ever better Sir Larry in Shakespeare? He managed to make it sound like ordinary every-day speech. Tory Historian has to plead ignorance of a rather curious coincidence: both Sir Winston Churchill and Lord Randolph Churchill, his father, died on January 24, seventy years apart. Lord Randolph died in 1895 at the age of 45. By this time his political career had turned to failure and his health steadily deteriorated, though whether it was tertiary syphilis that killed him, as it was believed for a long time, remains questionable. There is little that needs to be said about Sir Winston Churchill, unless it is to debate his achievements or lack of them. TH believes there will be rather a controversial article in the still delayed Conservative History Journal. The two pictures are not the usual ones. TH happens to be rather fond of that arrogant little seven-year old and of Lord Randolph as a spider. Tory Historian is back from Mitteleuropa and has finished reading the recent biography of Arthur Ransome by Roland Chambers, entitled for a rather inadequate reason, The Last Englishman. The reference is to the period immediately after the Bolshevik coup when Ransome was writing somewhat misleading letters to his mother describing himself as the last Englishman left in Petrograd or Moscow. Actually, there were quite a few still and new ones, such as Robert Bruce-Lockhart arrived. The title is as misleading as the letters were. The sub-title is The Double Life of Arthur Ransome. That is of greater interest. Ransome is known to most people as a superlative writer of children's adventure stories and books about sailing and fishing. A harmless old chap is the way somebody described him to TH. He was not actually completely harmless. Far from it. In fact, the sub-heading ought to be The Triple Life of Arthur Ransome. Before Russia there was Ransome the Bohemian man of letters whose marriage was beginning to fray at the edges and who had become embroiled in an unfortunate court case with Lord Alfred Douglas. Then there was Russia whence he reported during the First World War and the 1917 Revolution, where he became very friendly with various Bolshevik leaders, particularly Karl Radek and where he, apparently, aided and abetted the Cheka in various ways. Finally, there was Ransome the writer of the Swallows and Amazons books, the countryman, the sailor and fisherman. Which one was the real Ransome? As usual, the answer has to be all of them. Tory Historian had known about the triple strand before, in particular, about the friendship with the Bolsheviks and had often wondered how Ransome felt as his friends fell victim to Stalin. For he did not talk about it even if he did write a few obituaries of Old Bolsheviks who had died as "traitors". This book, however, goes further and shows that Ransome had clearly helped the Cheka by trying to extract information, spreading propaganda and bringing out diamonds and money for various organizations in the West. There is some talk of him being recruited by MI5 as well but the evidence for him doing anything for them is scant to non-existent. Questions remain. How did Ransome manage to miss or ignore the terrible cost that Lenin's great adventure as it appeared to him was imposing on the people of Russia en masse and individually? While many ignored what was happening in the cities and out in the countryside but paid attention to their friends' tribulations, Ransome did not even do that. When his great friends, the journalist Harold Williams and his Cadet politician wife Ariadne Tyrkova, were in danger Ransome seemed unaware of the fact or did not consider it important. Did he react the same way when, later on, his great friend Karl Radek abased himself at one of the show trials? How did Ransome feel when he described the unfortunate shortages, blaming them on everything and everyone except the Bolsheviks, when he knew that the leaders had plenty of food and lived in luxury? Did he not think there might be something wrong about large sums of money (smuggled out first by him, later by his second wife) being sent abroad to set up Communist organizations when large parts of the country were starving? Roland Chambers raises many of these questions but provides no answers because he can find none. For these reasons as much as Ransome's cantankerousness, he seems to end up disliking the subject of his biography with some intensity. Well, that is all very well and possibly that is what happens to all biographers. But Tory Historian cannot help thinking about those wonderful children's books that have inspired and entertained generations. No matter what one knows about the author, they remain as good as ever. Tory Historian is off for a few days to the old K und K, otherwise known as the Austro-Hungarian Empire. Two days in Vienna, three in Budapest, then back to Vienna and London on Saturday evening. In the meantime, it may not be possible to post. This is a good opportunity for readers to take a hand and suggest a few ideas for what ought to be covered by this blog and the secondary one, meant to be for longer pieces, in the next few weeks. Offers of articles are encouraged. TH looks forward to some very interesting ideas. Tory Historian is a big sniffy about that dead tree media outlet that calls itself the Conservative History Journal and would like to see more discussion on the blog. 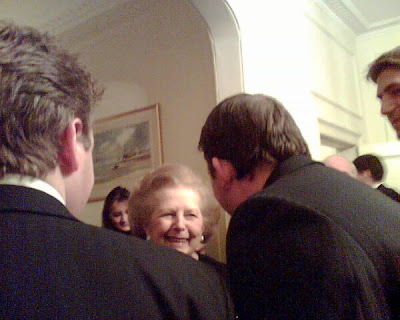 Having sighted the lady who is described by many as the greatest Conservative (or any other) Prime Minister of the twentieth century yesterday evening, TH would like to ask readers for their opinions on who was the greatest Conservative Prime Minister in history. Temporarily, anyway, as a trip to Central Europe is looming next week. In the meantime, it is worth noting that today is the very sad anniversary of the day when we knew that there would be no more Christies for Christmas. Dame Agatha Christie, one of the greatest and certainly the most widely read detective story writer died on January 12, 1976, having written 83 books under her own name and that of Mary Westmacott. Tory Historian has read but one short story by M Westmacott. It was very readable. The general opinion is that the Westmacott novels and plays are good middle-brow stuff and higher praise than that is difficult to find when discussing literature. Here, incidentally, is a handy list of all Christie's detective stories that also tells you who does the detection (well, more or less). Two Christie curiosities were published shortly before the lady's death: a Miss Marple novel, which is rather good, Sleeping Murder and a very bad Hercule Poirot one, Curtain. There is no question, she really hated Poirot by this stage. Both novels were written forty years earlier but put aside for posthumous publication, though it is not clear why that should be so with Sleeping Murder. As it happens both came out prematurely, so to speak. Christie's books, the good, the bad and the rather weak, all stay in print. It is hard to tell what it is about her work that attracts so many people. The style is largely pedestrian but absolutely clear and correct - the books are often used for teaching English and, one must admit, often there is a good deal of light irony. 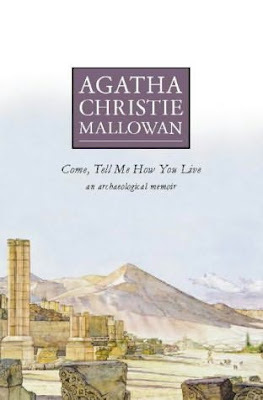 She could write considerably better as she demonstrated in the delightful story of her life as Sir Max Mallowan's wife, Come Tell Me How You Live. The actual autobiography, published the following year, is far less interesting. The stories move at a cracking pace though some of the plots creak just a tad. Others, of course, dovetail perfectly. The characters tend to be one dimensional but highly entertaining. And don't even mention time lines or dating. For someone who helped at archaeological digs she is very cavalier with dates and lapses of time in her novels. As against that, she often uses archaeology and archaeologists in the novels. When one thinks about it, the process of working out what there is in a dig and what it means is very similar to the process of working out what happened when a crime was committed. There is a great deal more to say about Dame Agatha and no doubt Tory Historian will do so on some future occasion. Now it is time to recall the lady who has given more pleasure per page of writing to more people all over the world than anybody else. She has also inspired books about her [scroll down]. Last year there was Elena Santangelo's Dame Agatha's Shorts (no it is not a little tale of Dame Agatha's career as a footballer) as well as Agatha Christie's Secret Notebooks, which proved to be less than revealing, though the book also included two hitherto unpublished and unknown Poirot short stories. Tory Historian's favourite of these studies remains the very French and intellectual Who Killed Roger Ackroyd? by the psychoanalyst and literary critic, Pierre Bayard. Professor Bayard not only thought Poirot got it wrong but explained at great length why though there is some evidence that he might have been playing games with the reader of the kind he accuses Dame Agatha of doing. Tory Historian would not be happy at my use of the "p" word but then I am not very happy at Tory Historian not posting for so long. Words will be exchanged. Anyway, I am proof-reading the Conservative History Journal, so progress is being made. It will be a corker, though I say so myself.